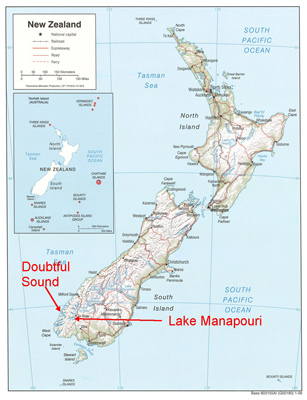 Map of New Zealand pointing to the location of Lake Manapouri where the trip to Doubtful Sound starts. 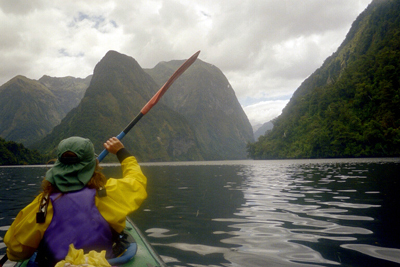 The best (and almost only) way to see Doubtful Sound is in a kayak. 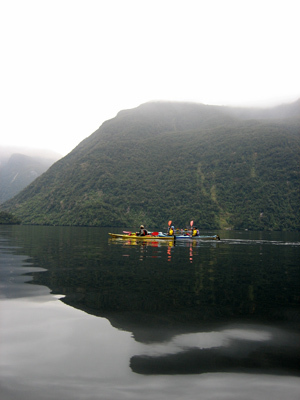 However, to get to the kayaks we first had to cross Lake Manapouri in a powerboat and then drive across Wilmot Pass in a minibus. 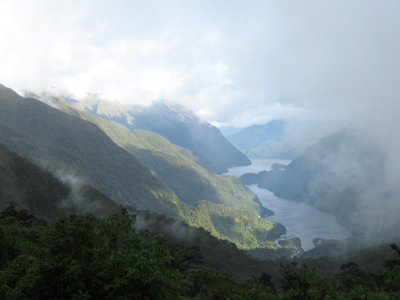 The view of Doubtful Sound see from the Wilmot Pass. Several hours later we finally got to the ocean and the sandflies..... We changed into the kayaking clothing as fast as possible and began the trip. Kayaking in rough conditions the first day. The first day the weather was pretty rough with low hanging drizzling clouds and strong wind and waves, which collectively added up to a pretty dramatic atmosphere. 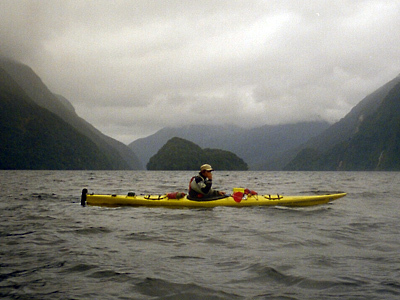 Elvira kayaking in Doubtful Sound. Late in the afternoon we stopped at one of the few beaches where it is actually possible to land the kayaks - in most places the steep mountains go directly into the ocean. Luckily, there was a sandfly free shelter where we could eat dinner - I have never seen so many sandflies in one place! 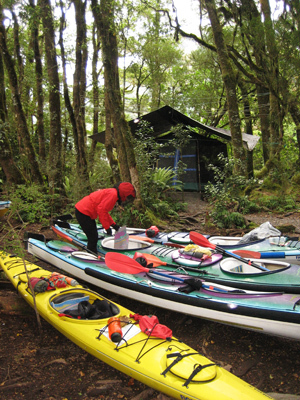 Elvira sorting gear in our kayak with the sandfly shelter in the back. Much to my amazement we were the only ones that had brought mosquito nets which were very popular among the other participants when they had to exit the tent! 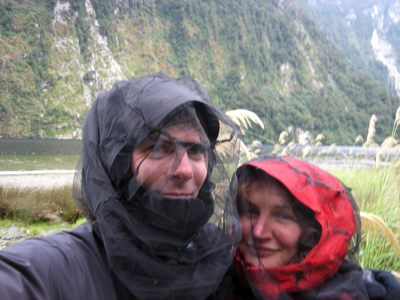 Elvira and Hans in our mosquito nets - the only thing that really works against sandflies! 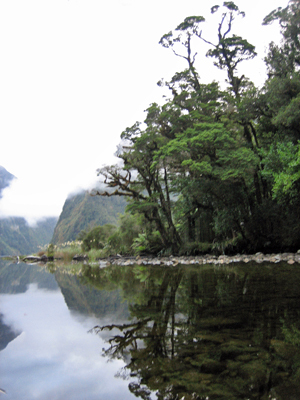 In the evening we walked up a river flowing into the Doubtful Sound with lots of beautiful vistas. One of the beatiful views of the river. The next morning, as we were getting ready to get the kayaks back into the water I suddenly heard a hissing sound. I ran to the beach and was amazed to see a school of dolphins approaching our camp site. I quickly notified the others and we got the kayaks in the water in record time! In order not to stress the dolphins we didn't chase them, but they came around several times which was the most amazing sight. 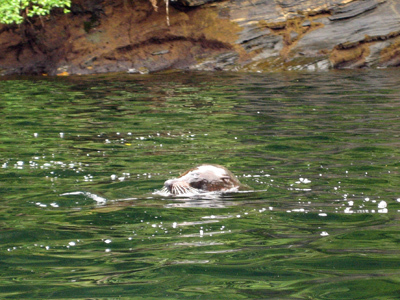 At one point the came so close to our kayak that I could see them swim under the water. Waow!!! 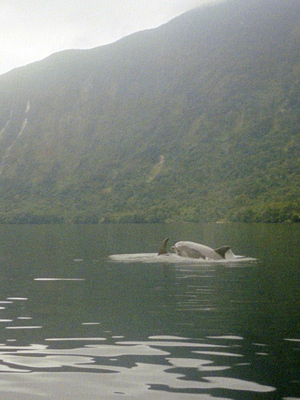 Dolphins swimming just past our kayak. Click on the picture to see a Quicktime movie of the dolphins. This day we were extremely lucky with the weather as the ocean was completely flat, which gave rise to the most amazing reflections of the rain forest covered mountains in the water. The flat ocean on day 2. 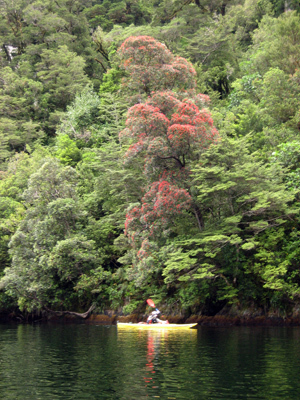 Note the tree avalanche slopes behind the kayaks. The rain forest was just beautiful and untouched and one stunning view replaced the other throughout the trip. It was also interesting to note big fields covered with grass rather than rain forest (see previous picture) caused by tree avalanches! The mountain slopes are so steep that the forest occasionally slide off! Pretty amazing! 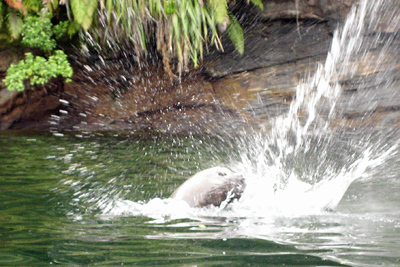 Just as the trip was coming to an end we suddenly spotted a sea lion in the water surface. A sea lion in peeking out of the water. It had caught a fish which is was killing by splashing it into the water! Click on the picture to see a Quicktime movie of the sea lion.